The Fed is closer than it has been in at least a decade to achieving both of its congressional mandates - to maximize employment and maintain low, stable inflation. Officials seek 2% annual inflation because they view that as consistent with an economy with healthy demand for goods and services. The employment debate is taking on more urgency because joblessness is expected to keep falling due to a burst of stimulus from recent tax cuts and government spending increases. If hiring and workforce participation trends since January continue, unemployment would reach as low as 3.3% by December, way below Fed officials' estimates of the level that is sustainable over the long run. It is easy to interpret this news as the economy continuing to support our federal government with ample tax revenue for the foreseeable future. 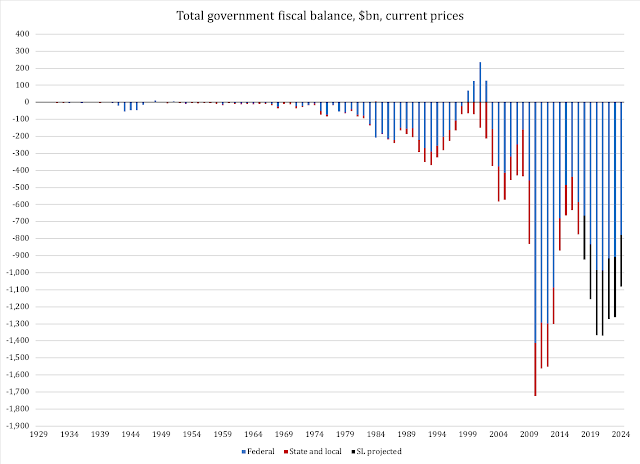 Therefore, the risk of a fiscal crisis should be essentially done away with, right? Not so fast. First of all, the good news from the Federal Reserve is mitigated by analytical factors behind their forecast, factors that will require a separate discussion. Those factors, however, strongly suggest that the Fed is skating on thin ice in its rosy macroeconomic predictions. Secondly, the Fed may very well rip the rug out from under the feet of its own prediction. As a direct consequence of this outlook, its Board may decide to raise interest rates faster than it otherwise would. If it does so based on the wrong forecast - and the line between right and wrong is thin - it could send our economy off into a recession faster and deeper than would otherwise be the case. This is where the federal budget comes into play. There is no doubt that the next recession is going to bring hard times to America's governments, forcing everyone from Congress down to city councils to make very tough fiscal decisions - tougher than almost every American politician can imagine today. In short: this is absolutely not the time for states and local governments to go to the federal government for more money. On the contrary, this is the time to start the work to turn off the fiscal faucet in your state, your county and your school district. Once the next recession hits, Washington will be engulfed in fiscal panic. Based on these calculations, next year we will be back to trillion-dollar deficits for the government as a whole. The Office of Management and Budget (OMB) predicts that in 2021 the federal deficit alone will reach $987 billion. This is not a reasonable forecast. It is far more realistic to suggest that the budget deficit will remain at, or even exceed $1 trillion in the next few years. In fact, it is easy to demonstrate how that could happen. The first part of the OMB forecast that is unreasonable is the idea that government spending somehow will grow at less than four percent per year. We need only look at the fact that Congress has now done away with all its self-imposed spending limits: the sequester, the debt ceiling and the cost containment board for Medicare. If they intended to keep federal spending in check, why would they institutionally liberate themselves of existing limits on spending growth? Secondly, in order to produce a revenue stream of the kind OMB predicts, we need GDP growth that goes beyond what is realistically going to materialize in the next several years. Gross Domestic Product at current prices is the best indicator for future tax revenue growth: eighty percent of federal tax revenue comes from personal income, and personal income rises and falls closely with current-price GDP. 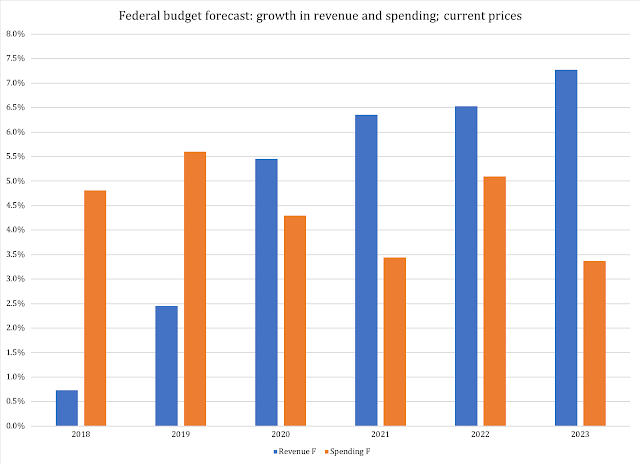 Therefore, in order to understand what growth assumptions are behind the OMB revenue forecast, we can "reverse engineer" their GDP growth expectations from their projected tax revenue. In 2014, the top 50 percent of all taxpayers paid 97.3 percent of all individual income taxes while the bottom 50 percent paid the remaining 2.7 percent. The top 1 percent paid a greater share of individual income taxes (39.5 percent) than the bottom 90 percent combined (29.1 percent). by contrast, income earners who declare $5-10 million in personal income earn 3.4 percent of all personal income but pay seven percent of all income taxes. 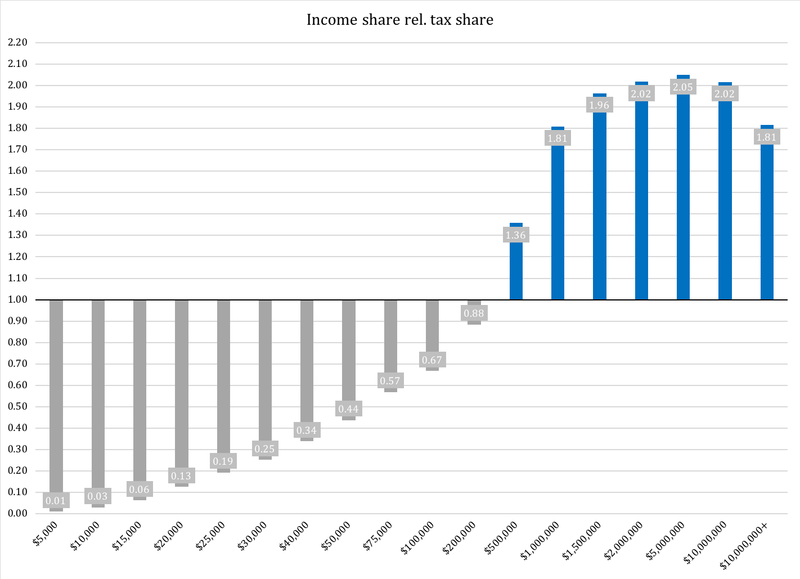 The first group's tax share is one quarter of their income share; the second group's tax share is twice their income share. No doubt, the lower income groups are asked to contribute toward the funding of the federal government to a far lesser extent than they would if they were taxed fairly. There are two practical messages in Figure 3. First, we have a highly progressive tax system, placing a disproportionate share of the tax revenue responsibility in the hands of a small group of income earners. Those earners, in turn, tend to experience more fluctuations in their incomes than other groups. The curve reporting the effective tax rate on a person's income has been pushed to the right. 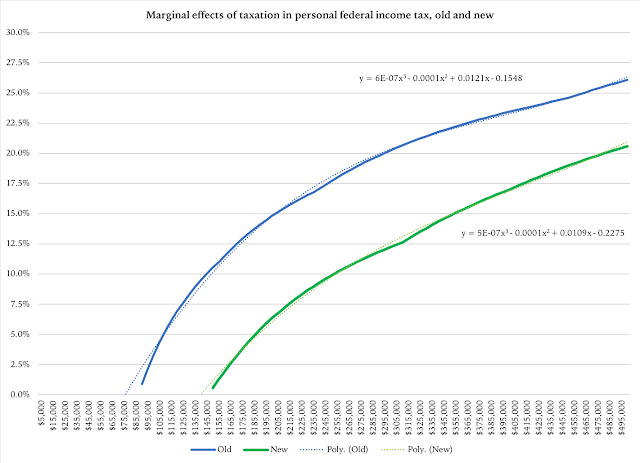 The reason for this is the increase in standard deductions; since the deduction reform was coupled with the same type of income-tax brackets as before the reform (see estimated coefficients in respective equations) the problem with tax-base concentration has de facto been exacerbated. 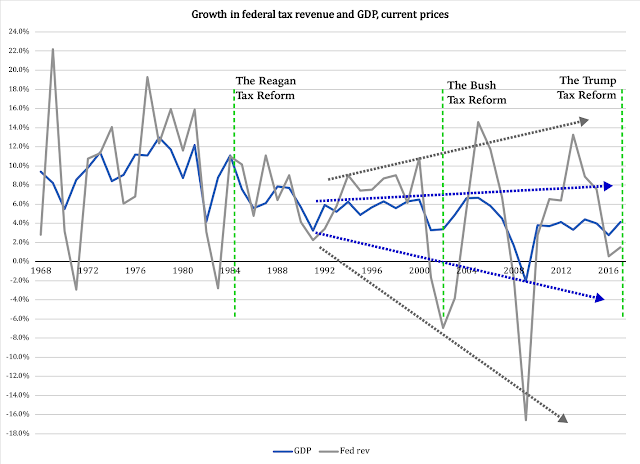 As a result, we can expect sharper swings in federal tax revenue in the future than we have seen recently. All other things equal, a real growth rate of 2.5-3 percent is not at all unrealistic. However, in the nasty thing called reality, things never remain equal. The biggest problem with this forecast is that it appears to overstate the growth generated by the Trump tax reform. As I explained yesterday, that reform has done a lot of good for business investments but has yet to generate any noticeable increase in the largest economic absorption variable: private consumption. In other words, it is realistic to expect growth at lower levels than what the OMB appears to be relying on. This in turn takes us back to the issue of high volatility in tax revenue. As mentioned, after the Trump tax reform, the federal government now relies even more heavily on even fewer taxpayers to fund the federal government. Small variations in GDP will have large repercussions for the collection of tax revenue. Plain and simple: it becomes more difficult to predict future tax revenue. However, it is not just the growth rate itself that is overly optimistic: it is the trajectory of rising growth. Given the character of the U.S. economy today, especially the role that government plays, it is unrealistic to expect anything close to three percent growth over the longer term. It is equally unrealistic to expect rising growth. This scenario does not even take into account a probable recession. Let us return to that scenario in another article. For now, the policy implication for state legislators and governors is clear: this is the time to reduce - not increase - your state's dependency on federal funds. Once Congress is forced into the fiscal-panic corner in the next recession, all federal money to the states will be on the chopping block. And chopped. The states will be left with the responsibilities to pay for Medicaid, highways, welfare and education out of their own pockets. To start doing that in a deep recession under urgent pressure of rapid-fire spending cuts in Washington, is like trying to build a house on a mudslide. If our states start today with reforms to get out of dependency on federal funds, they will be ahead of the curve once the fiscal crisis comes roaring into town. Those that act proactively will have time and money to do prudent reforms; those who wait will be in very bad shape.